Aspergers Victoria regularly receives requests from researchers to advertise opportunities for our members to be participants in their research projects. Listed below are current projects. Please ensure you investigate the requirements carefully before deciding to be involved. If you are a Researcher and have an authorised research study that is relevant to what we do, our members and which may be appropriate for us to publicise on our website, please complete the Research Request form and send an email to the Research Requests Co-ordinator with a copy of the research project that you want publicised through us and a copy of the ethics approval associated with the research. We will consider your request and respond to you as soon as possible. We would also appreciate you forwarding us the report or summary at the end of your project, so we may inform our members of the outcome of the research projects they may participate in. OTARC are seeking children/teens to be part of a study to take place in March 2019. The Safe and Sound Protocol (SSP) is a research based auditory therpay showing results in: social engagement and emotional regulation, auditory sensitivities and auditory processing anxiety. Attend one 2 month follow up testing session (2 hours) in May 27th-31st 2019. Listening to filtered/modifed mustic through headphones for 1 hour. Monash Uni are seeking adults with ASD to compare the effectiveness of using paper forms versus technology (specifically fitness trackers) in supporting self-management procedures to increase physical activity in adults with Autism Spectrum Disorder. Meet with the researcher at the start and end of the study for a discussion. Be trained to use self-management strategies to increase physical activity (jog and walk). Wear a fitness tracker for six weeks. Set goals, record progress, monitor physical activity levels. Meet with the researcher five days per week (20 minutes/meeting) to discuss progress. Deakin Uni are seeking parents/guardians of a child with disability to understand their experiences in the education setting. The goal is to make childcare, kindergartens and schools more inclusive for children of all abilities. This will help build AllPlay Learn, a new initative to create new pathways for inclusion for children with developmental challenges and disabilities so they can play, learn, dance and connect into the community. Parents/guardians of secondary school students who are either 1) currently attending school, or 2) have attended school in the past. This could be any mainstream or special education school. This includes children with any condition that affects cognitive, developmental (e.g. autism spectrum disorder, attention deficit hyperactivity disorder, intellectual disability, learning disorders, communication/language disorders), sensory (hearing or vision), or mobility functions (cerebral palsy), and children who need extra planning for medical reasons. This study is open to all families residing in Victoria. Completing an online survey at https://allplaylearn.org.au/get-involved which will take around 15 minutes. For more information please contact Dr. Tamara May email: allplaylearn@deakin.edu.au or phone: 03 9244 5084.
Review the AllPlay Learn Parent Survey flyer (pdf) or contact Dr. Tamara May at allplaylearn@deakin.edu.au or phone: 039244 5084. 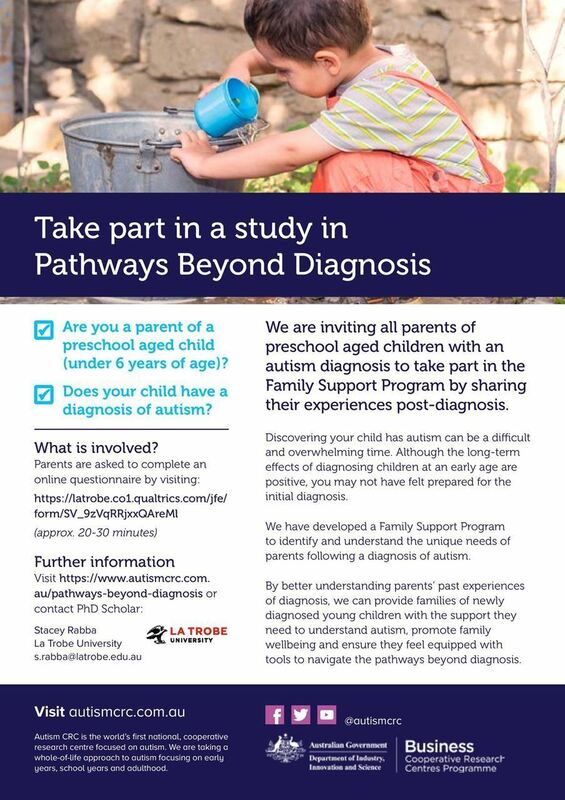 La Trobe Uni Autism CRC are seeking parents of a preschool aged child with an autism diagnosis to take part in a Family Support Program by sharing their experiences post-diagnosis. ACU are seeking parents of children on the autism spectrum, who are interested in being involved in a study aimed at learning more about what influences parents when making intervention decisions and to identify new ways to support parents with that decision-making. Attending (or via phone) a 1 hour interview with a researcher at Australain Catholic University, Fitzroy, (or other convenient location). Bringing copies of reports to verify your child's diagnostic information (e.g. age at diagnosis). Please contact Meghan Wilson (PhD candidate) at Meghan.wilson@myacu.edu.au if you are interested.